Tuff-Go™ brand site furnishings include products for public parks, picnic sites, campgrounds, streetscapes, schools and recreation centers. Our products are designed for any site or landscaping need and built to withstand harsh elements while providing comfort and value. 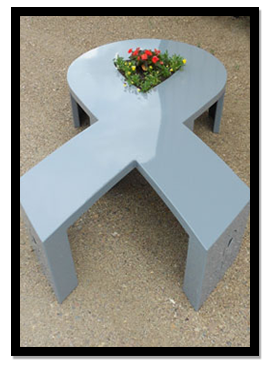 At Tuff-Go™, we can design, produce and powder coat a total line of site furnishings to go with any landscape and streetscape theme. Choose school colors, company logos, images or patterns to make your site furnishings unique. Tuff-Go™, along with our sister company, Bow Creek Metal, Inc., ha s over 16 years of experience in custom metal manufacturing, ornamental metal and industrial powder coating. 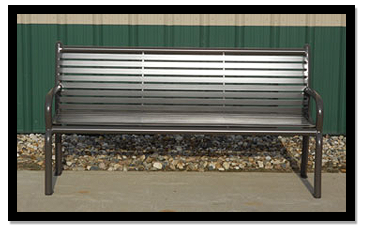 Our extensive list of site furnishings include benches, bike racks, railings, waste receptacles, grilles and campfire rings, picnic tables and more. We've worked with a lot of successful customers, in turn we have acquired knowledge and expertise in many areas. With this experience we're able to to provide valuable business knowledge as an over all experience. Over the years we have assembled an incredible staff armed with experience and knowledge. These individuals give Tuff-Go a technical and competitive edge. Fabrication, machining, welding, painting, assembly, quality control and testing, it's all done here without outsourcing. Everything is in house to allow quality control every step of the way. We believe credibility and honesty are paramount to success. Our workforce has over 60 years of combined experience, we test and inspect our work and deliver it right the first time.